To believe that we are truly deserving of judgement requires that we have the highest view of our sinful condition, which requires that we view our sin in the worst possible light, the highest offence in God's economy. This is in contrast to believing that we are not truly deserving of judgment because we hold a low view of our sin, viewing our sinful condition in the best possible light, of little offence to God in the grand scheme of things. As Paul writes in 2 Corinthians 7:10, "Godly sorrow brings repentance that leads to salvation and leaves no regret, but worldly sorrow brings death." But how is it possible to be truly repentant, truly aware of deserved judgement, when the heart is deceitful and beyond cure, as Jeremiah 17:9 tells us? The deceitful heart will provide justification for sin, all day long, as long as life endures. And it is because of this unrelenting justification of our sin, this constant belittling of our fallen condition, this "flesh giving birth to flesh" that we are unable to see the glorious kingdom of God. So to ask again, how is it possible to be truly repentant, truly aware of the deserved judgement when the heart is deceitful and beyond cure? Being born again by God's Spirit occurs when your deceitful heart is made aware of its own crafty lies and deception, bringing you to believe that what God says about you is true: you are a sinner that deserves nothing but judgement. Now fully awake and alive, the justification of sin halts and the awareness and belief of your truly deserved judgement begins. And this is why the gospel is called Good News, because we are not left by God's Spirit writhing in the guilty and tortuous agony of knowing we deserve nothing but judgement for our wretched sinfulness. Oh no! Awake and alive, we are then ushered into God's glorious kingdom of no judgement or condemnation, because God's Spirit has taught us and enabled us to repent and believe in the One who bore the judgment for us! How glorious is that truth! How amazing is that rescue! And what, in His kindness, has God done? He has led us to repentance! "The ability to learn on one's own is normally the result of a good education, and not normally the cause of it. Jesus teaches us that a "disciple is not above his teacher, nor a servant above his master" (Mt. 10:24). We're currently visiting with my parents in Pennsylvania and having a wonderful time although the hot and humid weather is bringing a spate of thunderstorms through everyday at some point, but they don't last long before the sun is back out. We've been swimming and hanging out with my brother's family, eating his delicious food, shopping, taking walks and visiting with the neighbors and having a go at their tree fort built for their grandkids. Today I bought Seth a fixed blade knife from our local Army and Navy store and required him to read the introduction to this book to help him with his whittling interest. My Mom showed him how to sharpen the blade using her father's whetstone and then she helped him find some fresh branches to practice on. Vacation is truly a wonderful gift. I do very little housework here and instead I have extra time to read through the books and curriculum materials that I ordered and shipped here. Not that I have uninterrupted hours, but it's a more relaxed pace and the kids can play outside with much less monitoring than I have to do at our home in Ontario. Tomorrow we have plans to go visit some historical places since we studied George Washington and the Revolutionary War this past year. It has been years since I visited some of these parks, so I'm curious what he thinks about seeing the real historical place. I have so many areas of study and creative work I want to do which is not really work to me, so I'm trying to give myself time to pursue them. 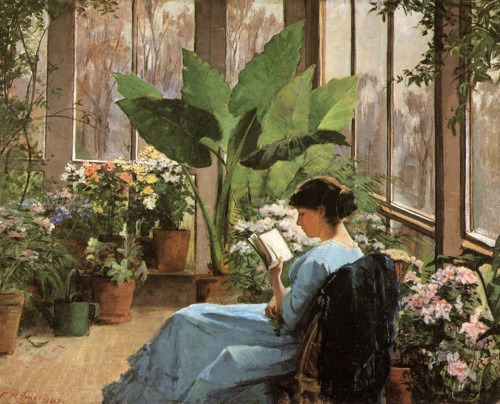 I'm reading up on how to propagate ferns so I can add to the lonely little plant growing in the front of our house. And my parents' longtime family friends and neighbors have tons of ferns that she is willing to let me play with and dig up. I'm also inspired to try to press plants and flowers between cotton fabric instead of the recommended paper towels since my Mom's paper towels all have a pattern on them. I don't know if the fabric will absorb the moisture as well as paper towel, but as my Mom has always said, "nothing beats a failure like a try." This world that God has created is so rich in natural beauty that I can't help but be curious and interested in His handiwork. I hope you feel inspired and motivated too! All art involves conscious discipline. If one is going to paint, do scuplture, design a building or write a book, it will involve discipline in time and energy--or there would never be any production at all to be seen, felt or enjoyed by ourselves or others. To develop 'hidden Art' will also, of course take time and energy--and the balance of the use of time is a constant individual problem for all of us: what to do, and what to leave undone. One is always having to neglect one thing in order to give precedence to something else. The question is one of priorities. Does this mean that we should all drop everything to concentrate on trying to develop into great artists? No, of course not. But it does mean that we should consciously do something about it. We all have talents and abilities whether inherent or learned, that God has given to us to use to create beauty and goodness. Taking time to develop and grow those passions is important work as we imitate God's work in creation. I have written about this before in a post called, not surprisingly, Important Work. It's fun to ask my friends and family what they pursue for the development of beauty and goodness. I need to do it more often and encourage them in these areas. What areas of art, beauty, and creativity do you like to pursue? Perhaps like me, you need to say with Anne of Avonlea, "I must get out all my ambitions and dust them." Learning to draw well is one of my ambitions and this page is from last year; I need to set aside time to "dust off " my drawing book and begin again. To put it succinctly: educated people know not only what they really mean but also what they are actually saying. ... You will be educated, which means that you will be interested where others are bored, that you will notice unities where others experience randomness, and that you will intend meanings where others are just spouting words. ~Eva Brann, Do You Know What An Odyssey Is? I put these quotes together but I'm still mulling over where I find myself in the process of being educated and educating others, namely our children. How well do I know other worldviews, for instance? This past Sunday at a church picnic, I conversed with a visiting university biology student who confided throughout our varied conversation, that science had messed her up in regards to her Catholic schooling and faith. Later after further inquiries, she related that she felt that the proof of evolution was at odds with the Bible and there was her faith crisis, along with grief over the passing of a much adored grandparent several years ago. I knew my studies in this area were inadequate to have a in-depth discussion with her own much more advanced knowledge of biology, genetics, etc. And shouldn't Christians of all people, be ready to give a reason for the hope that is within them? But it wasn't really a discussion about biology and evolution that needed to happen, it was a discussion about the goodness of God in the face of grief and pain that needed to be cried over together and hugs exchanged as I shared with her my family's unexpected loss of my younger brother those many years ago. I have come to see that frequently, it is not that someone needs evidences debunked or studies discussed, but they need their view on God and suffering challenged with empathy and kindness. They need someone to say, I have felt loss too, yet I still believe God is faithful. She asked in just a few words, how our family coped with a fatality in the family and the answer was that God is kind to us. She had been watching and interacting with Kate and loved her. She spoke of wanting to have and care for children of her own someday, and even special needs children if it meant they would be loved and cared for. But yet her heart is struggling with why God caused her grandmother to die so unexpectedly with no chance for goodbyes. I hear her heartache, yet we are not promised answers, but are asked to trust God with the reasons and obey His word for our lives. And really, what's the point of knowing a reason for a tragedy, if there is no true comfort provided? God provides comfort for His people and asks for us to trust Him that He is working out His purposes for His glory and our good. And that is very comforting, knowing that God, the Creator and Sustainer of this world has not forgotten His people; He is working for them. And knowing this, being educated like this, means that we should see unity and purpose where others see random and meaningless acts. We should intend actual meaning, where others just spout words. Our worldview should include knocking down(sometimes gently, sometimes staunchly; discernment is ever needed), those faulty worldviews that do not bring people into obedience to God's word and trust in His Providences. And we should be people who do it well, knowing our words, not fudging the answers or looking to impress the audience, but speaking clearly the truth of God's world to people who desperately need to hear it. I told my new young friend that I would be praying for her as she searches for peace and she responded gratefully, acknowledging that there are others who say they do as well. We have begun a friendship and she has allowed me to send her some articles and book suggestions that may help her as she searches. I care for her and I pray that God brings her to Him. Very very excited that Kate just blew into her little horn/recorder three different times producing a sound!! Two months ago she couldn't even organize her mouth to blow, let alone produce a sound! Annnddd, she is biting properly up and down on her chewy tube instead of one big chomp and fixing. I feel like we might just be turning a corner. Video to follow. Just a short clip to hear Kate blowing into her little horn actually producing a sound this morning. She had already made it toot three different times before I got the camera and shot this clip, so her patience was probably running short with the activity. We tried blowing bubbles after this but she hasn't figured that out yet. And on top of all this progress, she has been showing signs of being ready to potty-train, so I have been setting the timer for around 15 minute increments to put her on. After a few misses this morning, where she had just gone in her diaper despite me adjusting the timer to meet her frequency, we just now put her on and she went "on-demand" for the first time ever. She seemed to know what she should be doing, so time will tell if she really is ready or needs more time to figure this out. Just so very excited to see some progress in areas where I had begun to despair. Thank you for praying and all the kind concern that you all have expressed to me here and in person. We know she is loved and cared for by many, many people.